The first thing you'll want to do is to go to Petfinder.com and have a look around - if you put in your postal code when you get there it'll bring up a lot of local dogs who are looking for homes - so go to http://petfinder.com - and have a look around! Yarmouth SPCA - the first established SPCA shelter in Nova Scotia - opened in 1900! If you're willing to travel a bit - you can check out these SPCA's and rescues in PEI and New Brunswick!! Oromocto Area SPCA in New Brunswick - http://www.oromoctospca.ca/ - they have one of the best fostering programs in all of Atlantic Canada! http://www.citypound.ca/ - the dogs looking for homes here tend to be great! The little beautiful dog to the left is named Tia - and she came from Home Bound City Pound! 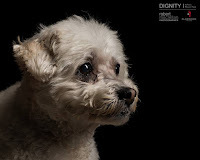 Elderdog is probably one of the most sincere and compassionate projects you are going to come across - they help older dogs and senior citizens - keeping older folks with their dogs in their homes, and also finding homes for older dogs that have been displaced when their older owners have had to to into a home - check out their website at http://elderdog.ca and you will agree with me pretty quickly and want to support them! And they are Nova Scotia based which is even better! Lillion Albion Shelter in Amherst is an awesome rescue - they have both dogs and cats there. SHAID Tree Animal shelter in Bridgewater - has both dogs and cats as well. Animal Rescue Coalition - one of the busiest rescues in Nova Scotia - they are a private rescue that doesn't have a "shelter" - they exist and rescue solely through private donations - and hard working volunteers who fund raise constantly and open their homes to foster the dogs and cats who come through the rescue's auspices - this is definitely a rescue worth supporting for all the hard and worthwhile work that they do! Home to Stay Rescue is a great rescue that gets in alot of great dogs - you should definitely check them out! Cool Dog Rescue is a rescue that specializes in bringing dogs in from away, they bring dogs in from Quebec exclusively that were supposed to be killed in shelters there - so you should check them out. Marley's Hope - is a local group that is expanding quickly - so they usually have quite a few dogs that are ready for adoption - and they need a lot of support so definitely check them out! People for dogs is not a rescue - but an advocacy group for Nova Scotia pet owners - they are working for more equitable regulations and legislation for animals in Nova Scotia - they have a very busy facebook group at https://www.facebook.com/PFDNS if you want to join them! Litters n Critters is a rescue society that is located in several areas of Nova Scotia - expanding from just the Halifax area - and has helped lots of cats and dogs over the years - check out their website to see if they have the perfect forever animal that you've been searching for. SHAID Tree Animal Shelter, Bridgewater, Nova Scotia - "Our doors are open to all abandoned and abused animals in distress" - one of the oldest, and most compassionate of all rescues in Nova Scotia - along with the Yarmouth SPCA, probably the 2 oldest no-kill shelters in the province. Beulah Berman Memorial Animal Shelter in Shelburne, Nova Scotia - "Saving one animal at a time" - one of the best, if not THE best animal shelters in the PROVINCE - yea! To the PET Project people - great things are happening in Shelburne, thanks to the volunteers there. Enough good things can't be said about these people! Lillian Allbon Shelter in Amherst, Nova Scotia (which is the town where I grew up) - they have a great website by the way! They are a fabulous private rescue that has their own shelter and they take in a lot of great dogs and cats - you should really check them out and think about donating to them - they're worth a second and third look! Down in Cape Breton there is Fur to Feathers who mostly deal in cats but sometimes also have dogs as well. They are in D'Ecousse Nova Scotia. A super rescue is Integrity's Haven Equine Rescue Centre Society - Angela Welburn rescues mostly horses but she also has cats and dogs as well - if it's furry she'll rescue it and find it a home! Check her out! There is also Forget me Not Animal Rescue Society to check out on Facebook who gets dogs and cats. These are all local people who live here and have connections to national breed rescues - so if you'd like a pure breed dog but still want to save a life you should contact one of these people! You can be put on a waiting list, or there might be a dog out there right now just waiting for you. They'd also be an excellent resource for asking questions about which breeders might be better than others when it comes to living conditions for their dogs. And I'm sure they'd also set you straight pretty quickly about buying your preferred breed from a petstore! If you know of a local breed rescue contact that I've missed, please email me at dogkisser@gmail.com and I'll add them here! Airedale Rescue is run by Maureen Tate. Her email address is divineaire@gmail.com Her rescue's name is "Second Chance Terrier Rescue and Adoption" and she has a website on Petfinder. Husky's have their own rescue in Nova Scotia - they have a Petfinder page at http://www.petfinder.com/shelters/NS43.html - they're a great breed for the people who love them, you should check them out! Ador-a-Bull Pit Bull Rescue - brings pit bulls down from Ontario who would die if they stayed up there. They were born after the onerous Pit bull ban came into force - and thus have no choice to either die, or be shipped out. They have been temperament tested and vetted and are perfect examples of their breed. Expect to be thoroughly checked out to make sure you're matched up correctly with your forever canine life companion - but you'll have the best dog you'll ever get! Springer Spaniel Rescue of Eastern & Central Canada - are a very active Rescue - I see them at every dog function and Doggy Expo - so they're a great breed specific rescue to see! Other Rescue Type Links that are Interesting!! Outside of Halifax is the North Mountain Animal Sanctuary - Founded by a professional and conscientious group of concerned Nova Scotians, NMAS is a no-kill sanctuary with caring and compassionate citizens devoted to improving the lives of farm animals. East Coast Aquatic Society meets regularly to talk about all things related to fish keeping! On their website they say: The East Coast Aquarium Society is a group of aquarists dedicated to furthering the aquarium hobby and promoting the practice of keeping tropical fish through the dissemination of information. Doesn't that sound exciting? http://www.atlanticcathospital.ca/ - website and virtual tour of the Atlantic Cat Hospital and Cat Nap Inn on Quinpool Road in Halifax where I take my cats - nobody knows this but there is jack russell dog behind the counter whenever the owners are there!! Best Friends Animal Society in Utah is a given! They are the grand-daddy's of compassion in action - I have a bumper sticker on my car that says "building a society through kindness to animals" - and it's true - and this is what the Best Friends people are doing - they are great.